Ho!Ho!Ho! 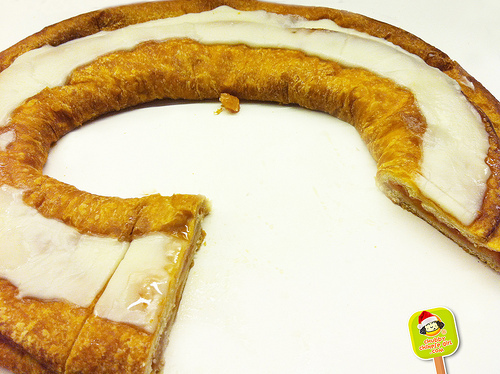 Sweet Christmas says Kris Kringle… (well at least at our office). Every year my very cheery, holiday loving boss orders boxes and boxes of these extra flaky and buttery Kringles for the office. 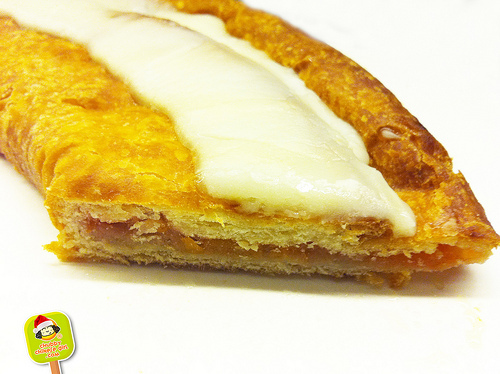 Danish puff pastry filled with nuts or fruit. We usually get the Classic Flavors like Pecan, Almond, Blueberry, Raspberry, Apricot. My all time favorites are the Apricot and Pecan. He takes a couple out in the morning (yeah… extra sugar and butter helps start everyone’s day) and a couple in the afternoon (sugar high picker upper). Usually a little slice is more than sufficient to satisfy your sweet tooth (of course a big slice is even better, specially since it’s the Holidays and being a little naughty never hurt anyone). Apricot has little pieces of dried fruit, a little sweet and a little tart, which makes a good combination along with the flaky pastry and the sweet icing. The Pecan ones has a nice crunch and real nutty flavors that adds to the buttery goodness. These have become our Holiday tradition. Every time we see them arrive and sit in our fridge, we know the most wonderful time of the year is near us. A sweet reminder. I think once you try them, it’s very possible these will become your new Holiday sweet tradition as well. May God bring you and your family lots of Love, Joy and Laugher!! !